In the previous post we created a new Angular 4 project. Lets check the how to add modules, components and routing. You could check out the code from here. We are going to use bootstrap styling . So lets add bootstrap in our aplication . We are going to use only styling not the components. We need to add the bootstrap stylesheet in tha .angular-cli.json. Wait we are going to lazy load this module , so we need routing inside the module, right? So we are going to create the routing also. If you check the employee.module.ts you will find the component in imported and declared in the module, so it will be available for the particular module. So we created all the necessary files . But wait how we are going to load it? First we will add the routing in the app routing for lazy load the module. Add these routes inside the const routes . Don't forget to import EmployeeListComponent. Now you can see the employee works . What we are going to do is, we will have our own services inside each feature module for API calss. Where we will set the API urls and its logic. 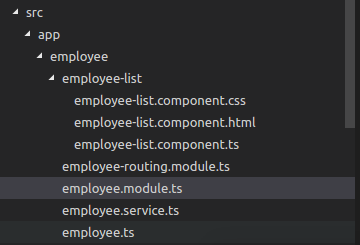 So in our employee.service.ts we will first inject the angular http service. lets create a function to get employees from the API. The http service returns a Observable so we will subscribe to this in the list component. So we are going to inject this EmployeeService inside the list component. At this time the cli will throw an error that there is provider for this service. ERROR Error: Uncaught (in promise): Error: No provider for EmployeeService! We need to provide this service in employee module. Please read more about service in here. This is because we need to import the map from rxjs . So that's it now we can call the API and render the result. So in employee-list.component.ts we will call the function. For knowing more about the ngOnInit read the lifecycle hooks in Angular documentation. In employee.service.ts the base_url needs to be your API end point. Later we will set in a single point. For current requirement we just keep as its is. Also we have config.ts in the src folder which will have the base_url that you need update the API end point. In the map we will convert the response, which in string format, will be converted to JSON. We will have a SharedModule which will not be lazy loaded, and includes the header component. We will add in app.component.html. Just like this add a new module and test it. I created a project module that you could try. Thanks for sharing worthy information. This is really helpful for learning. Keep doing more. As i told earlier am trying to switch to Flex , i am trying to learn connection between PHP and Flex. When searched i got a excellent tutorial . But the problem is that it uses PostgreSQL. As i don't have any prior experience in PostgreSQL i try to install it in my Windows 7 and configure it in WAMP . I got different errors and spend almost two days in searching and using different methods . Atlast i got it right. I will try to figure out the steps i have done. 1. Apache Version :2.2.17 2. PHP Version :5.3.5 3. MySQL Version :5.5.8 First install PostgreSQL , no need to install additional plugins like phpPgAdmin. Install WAMP server where ever you need. Download PhpPgAdmin and unzip it to WWW folder in WAMP installation. At this point if you try to access the http://localhost/phpPgAdmin/ you may get this error. It's been a long time since i have posted anything in this blog. I have been trying react-native for the last 3 months. And it's been a wonderful experience. From a Angular background it seemed difficult to adopt react initially. Once i got it, it seems very easy and interesting. About the performance of RN is just awesome. Installation is pretty simple. There are two ways to create an application, using expo-cli and react-native-cli. I prefer the second one. It seems like a little complex but when developing large application it's the best way to start. Once you install the cli we can create the application. It's my first blog post in year 2018 and it's a new technology. So it's crypto currency time. Wherever we look it's bitcoin and altcoins. After some thought i decided to try the blockchain. Just like any other technologies i used in the past, i decided to go for something small and easy one. Mining. Before understanding anything about blockchain, i tried mining. Yes I know it's not profitable one. but decided to go for it just to have some beginning. So everywhere i looked for mining, it's always high-end GPU/ASIC. I don't have a decent CPU with me. And it says CPU mining is not profitable. Okay. I agree. And i still went for CPU mining. Just because i would like to start taste the bitcoin.